If you would like a cow face on your t-shirt then this is the shirt to get. 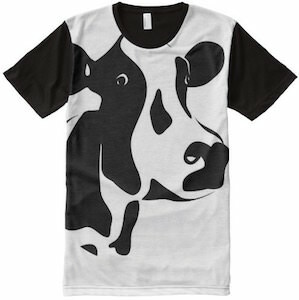 The t-shirt has a black back and sleeps and the front is white but has a black and white cow printed on it with his big head right in the middle staring at you. A t-shirt like this will get people smiling and that of course is a great way to meet people as everyone love a friendly cow and you t-shirt will have one on it. This cow face t-shirt comes in men’s sizes Small – 2XL and is made from 100% polyester by the people from America Apparel. For people like me it’s hard not eat meat and if you like me like cows to there maybe a solution. On this t-shirt you can see a picture of a cute cow and around it there you find the text that says “Save a cow eat a vegan”. I am not saying we should go try this but the t-shirt sure is funny. And this t-shirt comes in all kind of fun colors, sizes and styles for men, women and kids. And the shirt is even available in organic cotton. 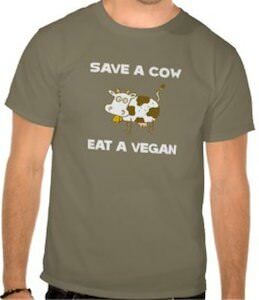 Now is a good time to shop for this fun Save A Cow Eat A Vegan T-Shirt. It shows a cow with a surprised look on it’s face and he asks the question “You Eat What?”. 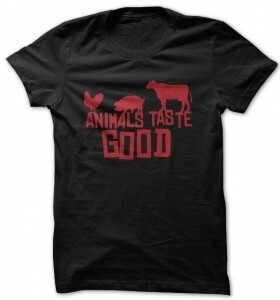 This for sure is a fun t-shirt to wear when you are a vegetarian it may even make people think. And the fun thing is you can get this t-shirt for the whole family from babies to adults it comes in all kind of colors and styles. 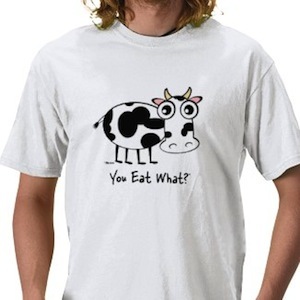 Show the world the cows question by wearing this Cow You Eat What T-Shirt. Cows are special animals with special skills. Some of them are ready to become you burger, some give you milk and others are ninja’s. The cow on this t-shirt is a ninja cow complete with samurai sword. If you are in to strange cows then watch out for the ninja cow. 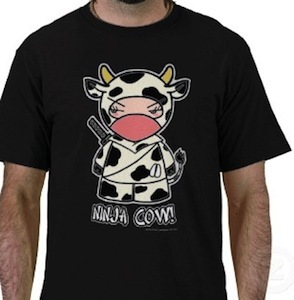 And to warn the world you can get yourself a Ninja Cow T-Shirt. Doctor Moo the cow version of Doctor Who. This cow even has it’s own Tardis to travel in time. 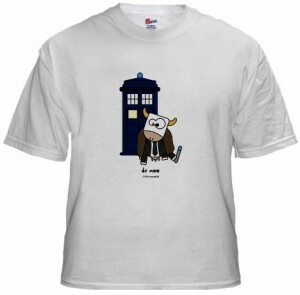 Check out this Doctor Moo T-Shirt.